Powers/Abilities: Tatiana could transform into a duplicate of anything that she touches the blood of. For example, if she touched the blood of a cat, she could assume the form of a humanoid cat. If she touched the blood of a person, she would assume the form of that person and could access their memories. History: (NYX#4) - After finishing a day at three different jobs, Tatiana Caban walked home and stopped to feed a group of stray animals. When she arrived home, her sister explained that their mom was out on a date. Their mother soon arrived home as well, bringing her boyfriend Reuben home with her. One of Tatiana's birds named Barretta flew at Reuben, who knocked the bird to the ground. Tatiana's mother made her apologize to Reuben and then slammed the door to her bedroom. 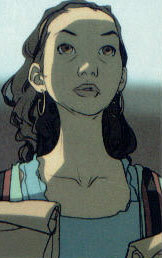 (NYX#5) - On her way to school, Tatiana witnessed a dog getting hit by a car. She quickly grabbed the bleeding animal and asked the driver to take her to the free animal clinic a few blocks down the street. After getting the animal to the hospital, Tatiana made it to the Bronx Vocational High School covered in blood. She soon began to pick up nearby scents and easily overheard her schoolmates whispering about her. After throwing up, Tatiana transformed into a dog-like creature with brown and white fur. She was immediately attacked by an anti-mutant mob at her school, who chased her into an alleyway. In order to better defend herself, Tatiana killed an alleycat and touched its blood, transforming into a black, cat-like creature and scaring away the mob. She was calmed down by X-23, who had arrived on the scene with Kiden Nixon and Cameron Palmer. (NYX#6) - After transforming back to her normal form, Kiden Nixon explained to Tatiana that she had been seeing visions of her dead father who told her where to go at key moments. Tatiana claimed to believe her, but opted to return home instead of staying with Kiden and company. She soon returned home to find her mother in bed with Reuben. As her mother started to argue with her, Tatiana was attacked by Barretta and then her cat, Skeeter. Terrified, Tatiana ran outside to find that Kiden Nixon had followed her. Kiden told her that her powers were not a dream and Tatiana agreed to join them. While staying with Kiden, Cameron Palmer, and X-23, Tatiana complained about what they planned on doing next. 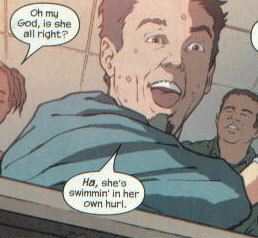 (NYX#7) - Kiden soon received another vision of her father, telling them to go back to Cameron Palmer's apartment. When Tatiana complained, Ms. Palmer told her that if she had a problem with things, then she could go back home to her family. After thinking about how awful things were at home, Tatiana opted to stay with the group. Upon arriving at Ms. Palmer's apartment, Cameron told the girls to wait behind and call the cops if her light did not come on. When it never came on, Kiden saw a vision of her father telling them to run away. Before they could do so, Kiden, Tatiana, and X-23 were confronted by the pimp Zebra Daddy and his men, who had been searching for X-23. X-23 jumped into battle, severing Zebra Daddy hand and Tatiana, calling herself Catiana, licked the dried blood on her clothes and transformed back into a cat-like form. While X-23 and Kiden battled Zebra Daddy and his men, Tatiana used her newfound claws to scale the side of Ms. Palmer's apartment to save her, all the while thinking about how silly the name "Catiana" sounded. When Ms. Palmer's attacker threw her from the building, Catiana managed to grab her hand. Ms. Palmer soon slipped from Catiana's grasp and fell, but was saved by Kiden, who froze time and placed a mattress under her. Tatiana jumped down to the ground in time to see X-23 stab Zebra Daddy through the heart. With the cops arriving on the scene, Tatiana, Kiden, X-23, and Cameron Palmer all left the scene of the crime with their newest ally Felon, who had been brought into the battle by a vision of Kiden's father as well. (X-Men: The 198 Files - BTS) - Following the events of "M-Day," Tatiana Caban was one of the mutants who retained her mutant abilities. She was cataloged by the Office of National Emergency, who saw her as a general threat in a possible war between mutants and humans. (Civil War: Battle Damage Report) - Tony Stark considered Catiana as a potential Initiative recruit. (NYX: No Way Home #1) – Tatiana accompanied Kiden Nixon as she dumpster-dove in an attempt to find a birthday present for Bobby Soul. Once Kiden had found a broken snowglobe, Tatiana went back to their apartment both her & Kiden shared with Bobby. Tatiana then sat at the kitchen table while Bobby tried to feed his younger brother. Cameron Palmer soon arrived to bring them all groceries and remind them all that they should be in school. A terrified Tatiana reminded Ms. Palmer that she couldn’t go back to her old school, as they all knew she was a mutant and with the Purifiers out in the world, she just could not return. Tatiana, Bobby and his L’il Bro later met up with Kiden after Kiden’s work shift had ended and they all prepared to meet Ms. Palmer for dinner. As they arrived at Ms. Palmer’s apartment, Tatiana & the others were shocked to find Ms. Palmer’s apartment ransacked and Palmer gone. (NYX: No Way Home #2) – As Tatiana once again felt like the world was crushing her, Kiden examined the area and decided they needed to get out of there before the police arrived. On their way out, Tatiana stopped to vomit. Upon arriving at Bobby’s apartment, Tatiana and the others found it surrounded by police. As Kiden used her powers to sneak into the apartment and gather their belongings, Tatiana asked Bobby if he would leave them and received no response. An hour later, Tatiana joined the others at a diner, where Kiden tried to talk the others into finding Ms. Palmer. Bobby opted not to help, in favor of taking care of his little brother, & asked Tatiana what she thought. Tatiana replied that she had no other friends & agreed to help Kiden find Ms. Palmer. Finally agreeing to help them too & showing the girls a hat he found in Ms. Palmer’s apartment, Bobby took the girls to an old acquaintance’s apartment, D’Sean, whom he thought to own the hat. Once inside, a gunman grabbed Tatiana & asked her at gunpoint why she was there. When L’il Bro distracted the gunman with a psychic projection, Tatiana bit the man, causing him to let her go and inadvertedly causing her to transform into the gunman’s form. Terrified at Tatiana taking his form, the gunman shot her. (NYX: No Way Home #3) – Confused, the gunman warned Kiden to stay away. As Kiden tried to stop Tatiana’s bleeding, Bobby took down the gunman. Kiden then interrogated the gunman as Tatiana returned to normal. D’Sean and his fellow gangsters soon returned to the apartment to find Bobby & the girls standing over a friend of theirs. Instinctively using her powers, Kiden froze time around them all, allowing them to escape the gangsters and get Tatiana to a hospital. As the doctors performed surgery on Tatiana to remove the bullet, the blood transfusion they gave her caused Tatiana to transform into the woman who donated the blood, prompting the doctors to call the police. (NYX: No Way Home #4) – Returning to the hospital to find armed gunmen surrounding Tatiana’s hospital bed, Kiden, Bobby & L’il Bro managed to grab Tatiana and escape via Kiden’s powers. Bobby eventually remembered a doctor that volunteered at shelters who worked on the sly and the group soon after took Tatiana to visit Dr. Cecilia Reyes in Chinatown. Dr. Reyes finished the surgery, successfully removing the bullet from Tatiana’s shoulder. She then told the group they could stay in her apartment for the night to rest. (NYX: No Way Home #5) – Following a run-in with the enigmatic Sniper Chick, Kiden returned to Dr. Reyes’ apartment with a black eye. When a recovering Tatiana and Bobby Soul asked what happened to her. Kiden gathered her things and prepared to leave, claiming it wasn’t safe. By the time Dr. Reyes had returned to her apartment, the group was gone and Tatiana had left a note thanking her for taking care of them, assuring her that they did not steal anything (except clothes & some food). Hiding out in an alley, Tatiana’s bleeding was stopped by Bobby Soul, who was fed up with living on the run. When Tatiana somewhat agreed and stated that they weren’t fighters, Kiden left them, walking out in front of a train and using her powers to avoid getting hit. All Tatiana and Bobby saw was Kiden disappear. L’il Bro (secretly manipulated by the spirit of Kiden’s deceased father) shortly thereafter projected an image of Kiden in trouble at Empire State University, prompting Tatiana and Bobby to find Kiden. Captured in the effort of trying to locate Kiden, Tatiana awoke to find herself facing the enigmatic Sniper Chick, who revealed herself as the kidnapper of Cameron Palmer. Sniper Chick then revealed that her job was to prepare others to ultimately live comfortably by preparing them for the harshness of reality. She then left Tatiana with the knowledge that Tatiana would have a choice to make soon. (NYX: No Way Home #6) – Sniper Chick returned to check on Tatiana and played a voice message threatening her and her friends. Taunting Tatiana, the Sniper Chick then told Tatiana she could choose to live or die, firing a gun at the ground to scare Tatiana. She then handed Tatiana the gun and told her choose. A terrified Tatiana fired the gun at Sniper Chick, hallucinating that she had killed the Sniper Chick due to the drugged drink Sniper Chick had given her. The Sniper Chick then informed Tatiana that actually killing would get easier over time, especially now that Tatiana had brought herself to pull the trigger. She then taunted Tatiana, claiming that Tatiana enjoyed bloood and then left Tatiana alone once more to look at Sniper Chick’s blood on the ground from an earlier cut to her face. Using the blood on the ground, Tatiana transformed into a duplicate of Sniper Chick and managed to free Bobby and L’il Bro. The trio then attacked Sniper Chick as she was torturting Kiden. After L’il Bro killed Sniper Chick with a psychic projection, Tatiana and Bobby freed Kiden and Ms. Palmer, who was delirious from her torture. Dropping Ms. Palmer at the door of Memorial Hospital, Tatiana, Kiden, Bobby and L’il Bro went on their way. (X-23 II#1) – While under psychic attack by the Gamesmaster, X-23 found the homeless Tatiana, Kiden, Bobby and L’il Bro talking about how they could continue living on the streets. L’il Bro soon projected a trail of images, prompting Kiden to freeze time and follow them to X-23, leaving Tatiana and Bobby to wonder where Kiden had went. After talking to X-23, Kiden brought her back to the group for a while. Still under psychic attack, X-23 warned Kiden and the others to stay away from her. While Bobby suggested they leave X-23 be, Tatiana claimed X-23 needed help. Their discussion was interrupted when X-23 leapt off the roof to be alone. When Kiden left to find X-23, Tatiana and the others followed, running into Wolverine. X-23 then decided to return to the X-Men, leaving Tatiana and the others to continue their lives while she continued hers. (Heroic Age: X-Men#1 – BTS) – In an effort to be ready for any new mutant activity, Steve Rogers wrote a brief dossier on Tatiana, referencing her file with the Office of National Emergency to determine whether she could be a possible threat or ally. Comments: Created by Joe Quesada and Joshua Middleton. One thing of note: In NYX#4, Tatiana's bird, Barretta was green but in NYX#6, the bird was colored white. Tatiana's last name was revealed in X-Men: 198 Files. Alice was a surgeon who operated on Tatiana after she had been shot by a gunman. When the surgeons started a blood tranfusion for Tatiana and Tatiana unconsciously transformed into the form of the woman whose blood she had received, Alice phoned the police to report an unregistered superhuman. Barretta was Tatiana's pet bird, who first attacked her mother's boyfriend Reuben and later attacked Tatiana herself when she returned home after her mutant powers manifested. Laurie was Tatiana's sister who lived with her and her mother. When Tatiana returned home after a long day at three jobs, Laurie informed her that their mother was out on a date in the middle of the afternoon. Chester was a boy in one of Tatiana's classes at school who picked on her. The day that her powers manifested, Tatiana had warned Chester not to start with her. After she had transformed into a dog-like state, Chester taunted her. Mister Ferrara was Tatiana's boss at Ferrara's fish market, the third job that she went to after school. He offered Tatiana some fish to take home with her after her day at three jobs. Louise was a nurse who, when Kiden and Bobby brought in the gunshot-wounded Tatiana, was convinced Tatiana was a criminal. When Louise saw on television that Tatiana, Kiden and Bobby were wanted for questioning in the kidnapping case of Cameron Palmer, Louise was about to question them when she noticed they were gone, unaware Kiden and Bobby had escaped using Kiden’s time-manipulating abilities. Reuben was the boyfriend of Tatiana's mother. When he first visited their house, he was attacked by Tatiana's bird, Barretta. He quickly knocked Barretta to the ground, calling the bird dirty and getting angry about it. When Tatiana's mother asked if he was ok, he replied that he needed a little TLC. The couple soon went into the mother's bedroom and slammed the door. After Tatiana manifested mutant abilities and returned home, she found Reuben in bed with her mother. 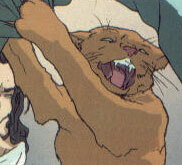 Skeeter was the pet cat of Tatiana who attacked her when she returned home after manifesting her mutant abilities. Senora Ventura was Tatiana's boss at Panaderia Ventura, a restaurant. Senora Ventura offered Tatiana some bread to take home with her in thanks for the work.